Managing your website, mobile applications or digital presence should be easy and uncomplicated. The Catalyst Content Management system helps you do just that. Our 'built from scratch' website & mobile authoring platform is an elegant yet powerful, easy to use backend interface with each module and functionality built specifically around your requirements. 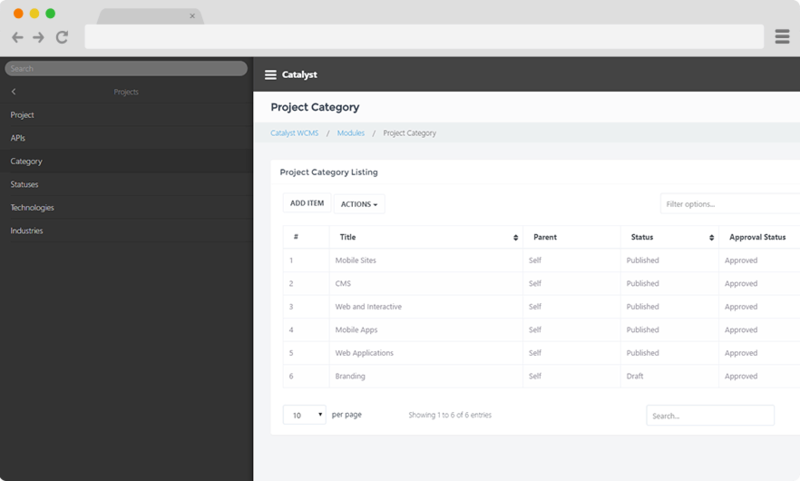 The Catalyst CMS Solution isn't only for desktop users. Take control on the movie with the convenience of the fully responsive CMS that is just as powerful on your smartphone or tablet as it is on your desktop. Modular & Scalable, the Catalyst Content Management System allows on the fly administration of content, inventory, media, reporting, MIS, user management and much more. 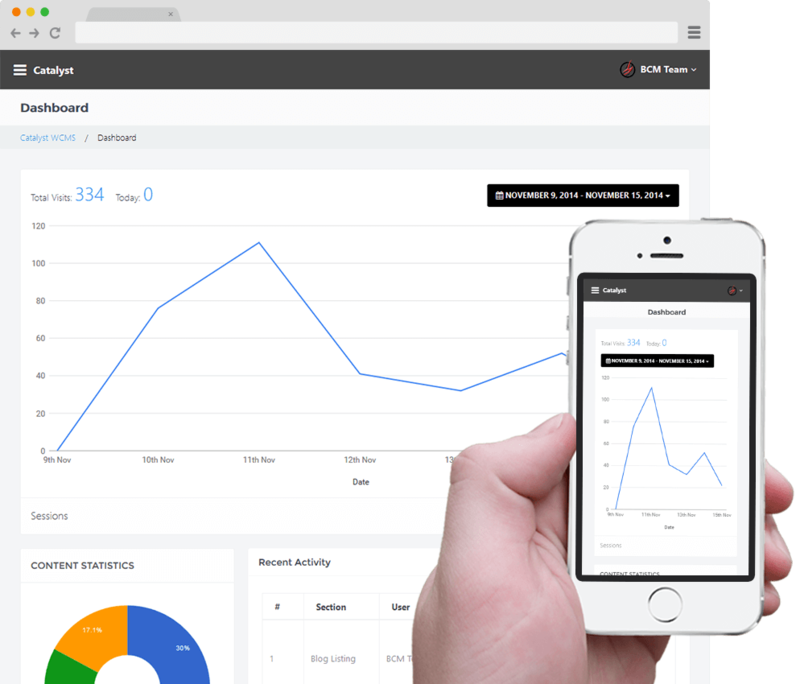 Built to handle any scale of website or mobile application, the Catalyst CMS platform provides a stylish and easy to use interface with a minimal learning curve. Built to be quick and powerful, the platform has been built on industry best practices for coding, MVC programming and optimization. Ground up modules allow you to work with a system that is built around your business and not the other way around. With built-in user management, analytics & content statistics, the Catalyst Content Management System platform is the perfect solution for isolated module access for teams, big and small. You're in good hands with our CMS platform which is currently being used by a range of MNCs, startups, media houses, businesses as well as individual clients. As a CMS and admin interface, the Catalyst Content Management System dons a variety of hats. Not limited to just websites, we have deployed the CMS successfully for a range of web applications, iOS & Android mobile applications, SAAS platforms and ERPs for over 200 clients. Built on MVC standards, the Content Management System has been architected with the intention to migrate in-house. This gives clients the freedom to either stay with us for future development needs or to opt for an assisted migration to their in-house tech teams.